New to Falconry, getting your first Bird of Prey? Look no further than our custom Starter Kit! We have everything you need to help you in your quest to take up our noble sport of Falconry. Have a question before taking up Falconry or before you get your first bird? Please do not hesitate to contact us, and also take a look at our Falconry page; designed to provide you with useful information on taking up Falconry and getting your first Bird of Prey! Taking up falconry and getting your first bird of prey? Our Starter Kit has the essentials you will need before getting your first bird! The following products are included in the kit which is suitable for Harris Hawk, Redtail, Goshawk, Ferruginous, Buzzard and most falcons. 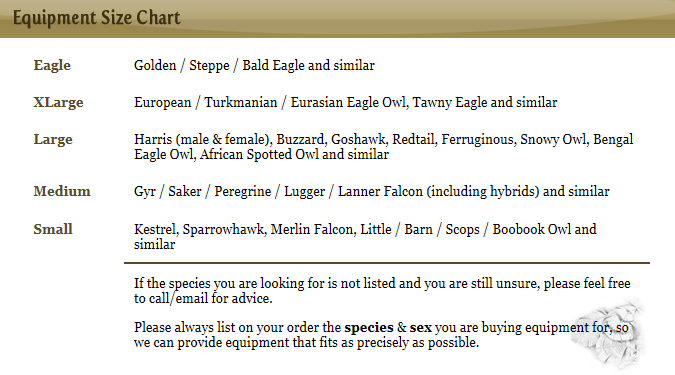 Please contact us before ordering if you are looking for a starter kit for a larger bird. PLEASE NOTE: Products in our Starter Kit can be altered to suit your individual requirements. You can either contact us to discuss your requirements or include your requirements in the order comment section in the checkout page.